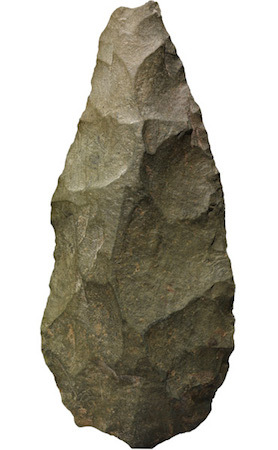 Made nearly two million years ago, stone tools such as this are the first known technological invention. This chopping tool and others like it are the oldest objects in the British Museum. It comes from an early human campsite in the bottom layer of deposits in Olduvai Gorge, Tanzania. Potassium-argon dating indicates that this bed is between 1.6 and 2.2 million years old from top to bottom. This and other tools are dated to about 1.8 million years. Using another hard stone as a hammer, the maker has knocked flakes off both sides of a basalt (volcanic lava) pebble so that they intersect to form a sharp edge. This could be used to chop branches from trees, cut meat from large animals or smash bones for marrow fat—an essential part of the early human diet. The flakes could also have been used as small knives for light duty tasks. To some people this artifact might appear crude; how can we even be certain that it is humanly made and not just bashed in rock falls or by trampling animals? A close look reveals that the edge is formed by a deliberate sequence of skillfully placed blows of more or less uniform force. Many objects of the same type, made in the same way, occur in groups called assemblages which are occasionally associated with early human remains. By contrast, natural forces strike randomly and with variable force; no pattern, purpose or uniformity can be seen in the modifications they cause. Chopping tools and flakes from the earliest African sites were referred to asOldowan by the archaeologist Louis Leakey. He found this example on his first expedition to Olduvai in 1931, when he was sponsored by the British Museum. Handaxes were still in use there some 500,000 years ago by which time their manufacture and use had spread throughout Africa, south Asia, the Middle East and Europe where they were still being made 40,000 years ago. They have even been found as far east as Korea in recent excavations. No other cultural artifact is known to have been made for such a long time across such a huge geographical range. Handaxes are always made from stone and were held in the hand during use. Many have this characteristic teardrop or pear shape which might have been inspired by the outline of the human hand. The beginnings of an artistic sense? Although handaxes were used for a variety of everyday tasks including all aspects of skinning and butchering an animal or working other materials such as wood, this example is much bigger than the usual useful size of such hand held tools. Despite its symmetry and regular edges it appears difficult to use easily. As language began to develop along with tool making, was this handaxe made to suggest ideas? Does the care and craftsmanship with which it was made indicate the beginnings of the artistic sense unique to humans? L.S.B. Leakey, Olduvai Gorge (Cambridge, University Press, 1951). K.D. Schick and N. Schick, Making silent stones speak. Human Evolution and the Dawn of Technology (London, Weidenfeld and Nicolson, 1993). Cite this page as: The British Museum, "Our earliest technology?," in Smarthistory, June 1, 2018, accessed April 22, 2019, https://smarthistory.org/our-earliest-technology/.